Something that comes up fairly often on the groups is, “why did I get this layer shift.” To be honest the easiest thing to do is check that you did actually tighten the grub screws down on each toothed idler on the motors but that tends to be a different kind of layer shift. One of those that just keeps continuing to shift every few layers until it looks like an Art Deco piece. What I want to chat about here is the science behind the seemingly random numbers on the Prusa MK3 buried in the support menu. I mean go check yourself right now. Head to your menu and scroll down to the Support and then head over to Belt Status. Bet you didn’t even know this existed and I could even guess that you don’t know exactly what these values translate into and why they matter. First off let’s make sure we understand what the values mean and how to get the correct value. So the belt status numbers are broken down into the 2 axes that have belts. The X and Y axes. Thankfully our Z axis doesn’t have a belt because I’d hate to have a third value to check on. So as an arbitrary value let’s say our Belt Status is 275 on the X and 270 on the Y. What does this mean? The numbers are value of resistance or in common speak they equal a value of how easy or difficult the motor has to work to move the axis. The number work in reverse order of logic so as the number gets smaller the higher the resistance or the more work the motor has to do to move the axis. So why is called belt status? I get you because it’s actually reading how smooth the motion is too so a bad bearing or swapping to a smoother bearing will affect the numbers somewhat, but nothing more than how loose or tight your belt is. Well Chris why I should I care about a value that doesn’t paint me a perfect picture. The honest answer is that it’s a good guide to help you resolve issues and keep similar machines in a known area. The smooth rods and bearings are typically consistent between thousands of machines and the linear movement is also very consistent. So the values should be somewhat consistent and after listening to 3,000 MK3 users I can say that the sweet spot values are fairly close to each machine. If we dig in the Prusa Handbook for the MK3, you know, that book you most likely didn’t read, it has a known range that Prusa would like your printer to be within. I call it, “the range Prusa says it should be in.” For those wanting to find that info it’s page 71 of the handbook. They say that the belt status reading should be anywhere from 240 plus or minus 40 so in other words a value between 200 and 280 is good. That’s a huge range and I can tell you with great certainty that the range is too big. After watching and helping the best values seem to be between 255-270. If you’re close or even within it then you shouldn’t be reading this because you’ve successfully assembled your printer and are within the best values your axes can be. I commend you sir or ma’am. So what do I do if my value isn’t within this range of 255-270? It depends on which direction we have to go. If your value is above 270 then your belts are loose, remember that higher is less resistance so less tension so it’s loose. We need to tighten them which for the Y axis is a breeze for the most part but the X axis can be a pain. The latest revision of the MK3 X axis motor holder offers a belt tensioner or sorts but sadly it only offers 1.8mm of belt tightening. For those that want to know the distance between each tooth of the belt is 2mm. So if you’re just a single belt tooth off or more the tensioner will not do anything and you’re stuck disassembling the extruder body to remove the belt and tighten it the ole fashioned way. If you’re crazy like me you should swap the carriage and X axis for the Zaribo parts because they give you actual control over your X axis belt tension and they are just better in every way. Here is the X axis ends and here is the Carriage parts. Now the opposite of course is if your’e belt status is like 230 or something crazy like that it’s time to loosen that which can be a pain for the X axis again and very simple for the Y axis. Please note that ANY adjustment to the belt will need a Self Test done to update the values of the belt status. So go to Calibration then Self Test and let it do it’s thing before heading back to the Belt Status menu. But again why do these values matter? A loose belt is problematic. If you’re outside of 280 the MK3’s ability to return from a crash is compromised so not only are you creating shifts in your print but the printer can’t recover because it can’t properly calibrate. That 240 plus or minus 40 range is so that the features of the MK3 actually can work. So get those values set properly so you don’t cause shifts and if you do have them the crash detection will work properly. So what if they are too tight? Does that actually affect anything. SURE DOES. It’s called backlash. If you get those belts so tight and you can pluck a musical tune every time the printer head starts and stops you are making for a beautiful display of resonance and bounce. This is why it’s crucial to get the values no lower than 255. It just won’t print pretty anymore. Don’t believe? Print this wonderful backlash test and see how you fare. Well that’s all I can say on the subject. Use the belt status menu and try to get those values somewhere within the range suggested. Now if it’s impossible to get the values any closer to those I’ve provided you may have either switched to igus bearings or something else is up. Do not tighten up the belts to the point where things are breaking. I’ve heard of some users who swear they can’t go any tighter and are above 280 so if that’s you then I’d contact Prusa support and see if they have an answer. So i tried to tighten the belt more because i got only 285/290 in belt status menu. Sorry for the dumb question, but could you please give more details on how to tighten the belts? I finally rebuilt my Y-axis with a real tensioner, and wow, I didn’t realize how tight the belts need to be. i’m at the point that any tighter and i rip the x axis belt out of the carriage when putting the stepper back into position and while ive gone from 188 to 177 its still higher than the 170. the y axis is 173 and so tight that i’m nervous its going to rip the printed parts apart. am i missing something? Backlash is a result of loose belts, not over tightened belts. Please review definitions of the terms you are using. 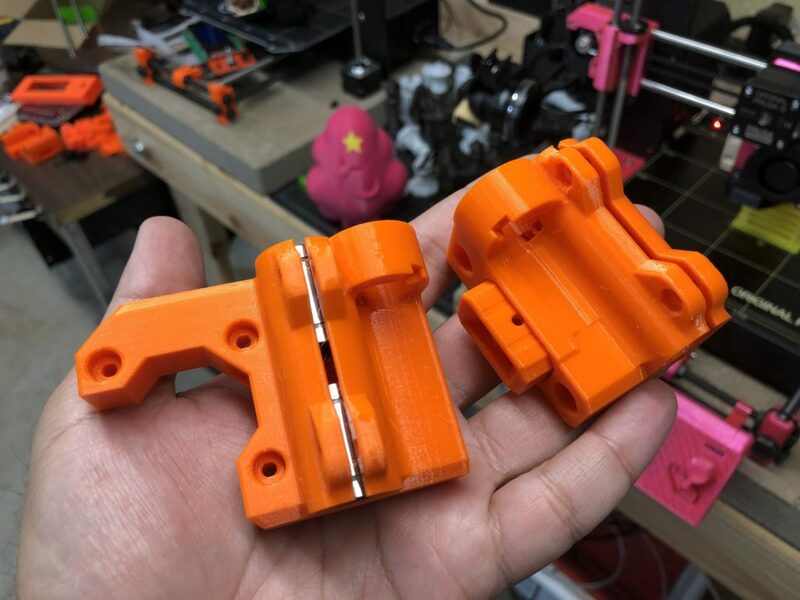 You mention swapping the carriage and X axis parts for the Zaribo parts, can you give some more information on which parts are needed? Do belts eventually wear out ? I’m looking at the Zaribo X mods, apart from the screws and nuts, do I need to buy new rods? I don’t see them mentioned anywhere. It should be mentioned that “-1” means “not measured yet”. I stumbled upon this problem and found no answer in the Prusa documentation. Very nice article that made me aware of the need to tension my x- and y-belts. However, the self-test does not provide results that make sense. I started with very loose x-belt and a value of 299. Reduced the belt about 3-4 mm:s and increased tension with the adjustment screw. When plucking the belt it sounded like a guitar string. The value went to 297. Reduced the tension so that it made low bass string sound and got to 293. The printer is performing better than ever and it is because of this article, but not because i followed the tension values.